Latest news about Tamdeed Projects Services. Tamdeed’s main task is to provide a complete set of solutions in the cabling infrastructure field in the United Arab Emirate, the GCC region and other international markets. With the aim to become the No 1 choice in UAE for offering a complete turnkey cable infrastructure solution, Tamdeed’s scope of work covers all aspects of indoor and outdoor cabling systems - Outside Plant (OSP) and Inside Plant (ISP) Fiber Optic Network Solutions to Operators, Business and Government entities. As part of the many tasks coordinated to achieve this challenging objective, Tamdeed was certified by the BSI (British Standards Institution) with the ISO 9001:2008 Certification. “QMS – Quality Management System have been implemented since the very beginning of Tamdeed’s inception. One of the most notorious achievements has been the permanent certification of Tamdeed with the ISO 9001 standard; the last certification is a proof point of Tamdeed’s belief: Quality is never an Accident, but is the Result of Intelligent and Disciplined Efforts” said Mr. Ahmad Darwish, General Manager of Tamdeed. ISO 9001-2008 is important because of its International and Systemic Orientation. Tamdeed serve customers who demand an international standard of excellence. We need to have Quality Management System to achieve the quality standards: right policies, procedures, records, technologies, resources and structures. “The achievement of this certification by Tamdeed shows the strategic commitment of Etisalat Services Holding towards Quality Management System. The certification is may be the most recognizable milestone, but is only part of a set of activities that have been implemented in that direction” said Mr. Ahmed Abdulrahman, vice-president of Corporate Strategy and Support Services from Etisalat Services Holding. From small and large enterprises to government and state entities, all information traffic rely on a data network infrastructure which is the vital pillar and platform that ensures the availability, reliability and security for the overall IT strategy. That’s the reason of Tamdeed’s permanent commitment with Quality and customer Satisfaction. Dubai, 12 April 2009, The Etisalat Academy and Tamdeed Projects are looking to train and recruit sixty technicians who will be given the chance of a lifetime to begin a career in the telecommunications sector. The Etisalat Academy and Tamdeed Projects are searching for suitable candidates with experience working as technicians, installers and cable jointers who wish to be trained as FTTH (Fibre-to-the-Home) technicians. Applicants who successfully complete the training programme will be offered a one year contract with Tamdeed, working on the installation of fibre-optic networks across the UAE. Applicants should have good English communication skills and installation experience preferably with a background in telecoms or electronics and can apply by visiting www.ea.ae/content/ftth. Tamdeed Projects is a company specializing in the deployment of fibre optic cables, including design and project management. It is responsible for laying and installing the next-generation fibre network that is being deployed across the UAE. “The future of telecommunications is being driven by bandwidth hungry services such as video and business applications. This places increasing stress on the communications infrastructure and drives the need for fibre optic cables. The knowledge that we will impart to these fortunate sixty candidates will last them for many years to come, guaranteeing a better life for their families today and in the future,” said Ahmed Darwish, General Manager at Tamdeed Projects. The training programme will last seven days and consists of continual assessment of both theoretical and practical work, culminating in an exam. The training will take place at the Etisalat Academy, Dubai. The course is subsidized and approximately 60% of the cost will be covered by Tamdeed Projects. The applicant will also need to contribute a sum of Dh 3,900 towards the training, which will be returned to them after completing one year of service with Tamdeed. The Etisalat Academy is a centre of learning excellence, open to the wider Business community, not just for Etisalat employees. Its sheer size and location nestled amongst the palm trees in Al Muhaisnah, Dubai makes it unique within the region. Abu Dhabi, 26 May 2009, The Etisalat Academy today announced that the first batch of thirteen young technicians have completed training and have secured jobs as FTTH (Fibre-to-the-Home) Technicians with Tamdeed Projects. More than 500 have applied since the Etisalat Academy announced the life-changing opportunity in April. The Etisalat Academy and Tamdeed Projects plan to train and recruit a total of sixty technicians who will be given the chance of a lifetime to begin a career in the telecommunications sector. Anyone interested in applying is invited to submit their application via the Web site www.ea.ae/content/ftth. The training programme took seven days to complete and consisted of continual assessment of both theoretical and practical work, culminating in an exam. The training takes place at the Etisalat Academy, Dubai. The Etisalat Academy and Tamdeed projects are continuing to seek appropriate candidates to fill the remaining places. They should have good English communication skills and installation experience preferably with a background in telecoms or electronics. They will also need to contribute a sum of Dh 3,900 towards the training, which will be returned to them after completing one year of service with Tamdeed Projects. The Etisalat Academy is a single source provider of business skills, leadership, government development, telecommunications and IT programmes, with the capacity to train more than 1,500 professionals per day. Learning programmes are available to the wider Business community. Nestled amongst the palm trees in Al Muhaisnah, Dubai the campus boasts an auditorium, sixty training rooms, overnight accommodation for 260 people, restaurant, coffee shops and a sports and leisure club. Etisalat announced it's racing against time to complete the fibre-to-the-home (FTTH) network in Abu Dhabi during the third quarter of this year to make the emirate the world's first city to have such a network. "We completed 70 per cent of the network in Abu Dhabi city. Within a few months the whole network will be complete," Ahmed Darwish, General Manager at Tamdeed Projects, one of etisalat Services Holding's subsidiaries responsible for the network's implementation in Abu Dhabi, told Emirates Business. He added Abu Dhabi is included in the first phase of the fibre-optic network, which will be executed throughout the country subsequently. More than 2,000 technicians are working day and night to complete the network at the UAE level. Some 50 per cent of the network is complete in Dubai, while the network's installation is still in its first phase in the Northern Emirates. Tamdeed finished the installation of 300,000 out of total 1.4 million optic fibre-optic devices in the UAE. The whole network in the UAE is projected to be complete in 2011, when the UAE will become the region's first country to have an integral fibre-optic network. 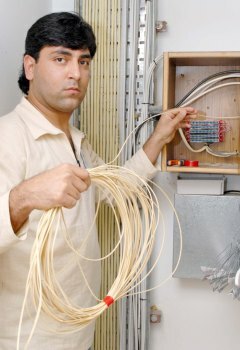 Tamdeed started the network installation in Abu Dhabi in 2007. Abu Dhabi was selected first because it is the capital of the UAE and because it is easy to install the network as the majority of the buildings are new in the capital. "Tamdeed's technicians installed the fibre-optic network instead of the old copper devices, which are linked with internet and land line, in majority of homes and shops in Abu Dhabi. The fibre-optic cable is capable of transferring huge data, pictures and information. The cable also has few maintenance problems; its virtual age is longer and cost lower. In future, the cable will provide several services, including land line, internet and satellite channels, through one wire. Clients will get just one monthly bill for all the services they subscribe to. "Initially, majority of people expected etisalat to charge for the network's installation. However, they are now reassured that the network is installed free, and are wholeheartedly co-operating with Tabreed," he said. Meanwhile, etisalat Academy and Tamdeed projects are looking to train and recruit 60 FTTH technicians. Authorities are looking for candidates who have work experience as technicians, installers and cable jointers and who wish to be trained as FTTH technicians. Applicants who successfully complete the training programme will be offered a one-year contract with Tamdeed, working on the installation of fibre-optic networks across the UAE. "The future of telecommunications is being driven by bandwidth-hungry services such as video and business applications. This places increasing stress on the communications infrastructure and drives the need for fibre optic cables. The knowledge that we will impart to these 60 candidates will last them for many years to come, guaranteeing a better life for their families today and in the future," said Darwish. The training programme will last seven days and consists of continual assessment of both theoretical and practical work, which will culminate in an exam. The training will take place at the etisalat Academy in Dubai. The course is subsidised and approximately 60 per cent of the cost will be covered by Tamdeed Projects. The applicant will have to contribute Dh3,900 towards the training, which will be returned to them after completing one year of service with Tamdeed. The Etisalat subsidiary that is rolling out the Middle East's first national fibre-optic internet system will use the experience to bid for similar contracts overseas. Tamdeed, a unit of Etisalat's services division, is responsible for bringing the system into every home and workplace in the country, all the way from digging and laying cables to rewiring villas, offices and apartment buildings. "For now, we're focused on the UAE, but we will capitalise on this experience to go outside, and also to serve Etisalat International whenever they need us, said Ahmed Darwish, the general manager of Tamdeed. "Most countries in the GCC are going for an FTTH system, but Etisalat is far ahead, he said. "Abu Dhabi will be the first capital in the world, by the third quarter of this year, to completely migrate to FTTH. A team of more than 2,000 technicians are working seven days a week installing the fibre-to-the-home (FTTH) network, in one of the country's most ambitious infrastructure modernisation projects. The network, planned to reach every home in the country by 2011, already connects to 300,000 homes and offices. Fibre-optic cables transmit information as beams of light, offering an almost unlimited capacity for data transmission, with the potential for internet speeds up to 100 times faster than systems based on copper wire. The project is part of Etisalat's role as an agent for national development, and the company does not consider notions of cost versus benefit when evaluating whether to extend optic fibre to remote or difficult-to-reach areas. "Anywhere in the UAE served by Etisalat, by 2011 we will reach all of them, Mr Darwish said. "It is part of our commitment to the country â€“ we should serve everywhere, without looking to the economics of it. Homes connected to the network will be able to access increasingly fast internet services, alongside high-definition television and standard telephone service. While fibre has a theoretical transmission speed of up to one terabyte (1,000 gigabytes) per second, actual download speeds will be limited by the bandwidth and capacity of Etisalat's international connections. "Within the country, there is no limit, Mr Darwish said, "but most content is not in the UAE. I can guarantee your speed in the UAE, but if you are downloading from the US or Europe, you will also be dependent on the international connections.